How Do Charities Use Your Dollars? 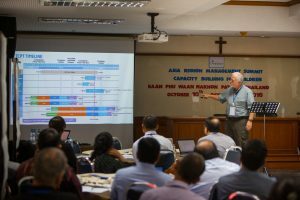 Ed Anderson, Compassion International’s chief financial officer, discusses information systems with ministry workers in Thailand in October. The ministry’s field offices in 26 countries work with nearly two million children. Americans donated more than $1 billion to religious charities last year. But which charities use donor dollars best? And which evangelical parachurch organizations deliver the most “ministry per dollar”? That’s what I wanted to find out. I contacted nearly 3 dozen ministries, requesting their audited financial statements so I could “look under the hood” and see how much they actually spend on ministry program. (As opposed to overhead, fundraising and other non-ministry costs). One) a “local” article published in the Colorado Springs Gazette focusing on that city’s 23 largest parachurch organizations. Two) and a “national” article focusing on 20 widely known national ministries published by Religion News Service. First, ministries vary widely in how much of your money they actually devote to ministry. Among the ministries I researched, the most efficient was every home for Christ (88 cents of every dollar go to ministry programs), while the least efficient was Prison Fellowship (only 62 cents of every dollar go to ministry programs). Second, ministries differ in how transparent they are about their financial operations. I was surprised to discover that four Colorado Springs-based ministries that belong to the Evangelical Council for Financial Accountability violated the council’s transparency standards by declining to provide me with their audited financial statements. Thank you for bringing the ECFA guidelines to our attention. We have since added a link to our most recent audited financial statement to our public website (http://www.navigators.org/About-Us/Financial%20Report). -See if the charities use support make their audited financial statements available, either online or by request. -Use these statements to find out how much of every dollar charities spend on “program” (the good works that are the reason you’re supporting them). -Check the websites of charity watchdogs like Charity Navigator and Ministry Watch, both of which helped me in my research. In the “local” version of the story I showed how Compassion International gets it right when it comes to transparency. The ministry makes more than a dozen financial reports readily available for all to see on its website. I edited Compassion’s magazine for a few years, back in the day. Every year, President Wally Erickson insisted we add eight pages to the November/December issue so we could include the latest audited financial statement. When I interviewed Compassion’s chief financial officer Ed Anderson for the article, I got the distinct impression that financial integrity remains a core value at this ministry.